Want to Have Peace of Mind? Get Moving! Want to know your risk for dementia? It may be related to your fitness level. You likely already know that exercise may help prevent obesity, heart disease and other diseases that affect so many Americans. And now, if you need yet another reason to get moving, a recent study suggests that having a high cardiovascular fitness level (stamina) may lower your dementia risk by nearly 90%! According to the Alzheimer’s Association, more than five million Americans are living with Alzheimer’s. By 2050, this number could be 16 million. And one in three seniors dies with Alzheimer’s or another form of dementia. Clearly, we have to be proactive about preventing dementia, and evidence from the study suggests that being in shape is a great way to help protect yourself from cognitive impairment. Researchers examined 191 Swedish women, between the ages of 38 to 60. 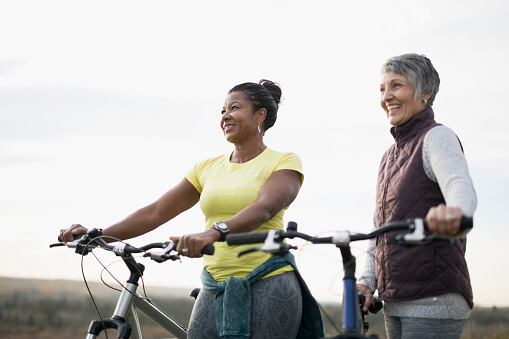 The women’s cardiovascular fitness level was tested by seeing how well they performed on a bicycle exercise test.These exams first started in 1968 and the women were followed up to 44 years, making this a very extensive study. On the bike tests, women were asked at certain periods if they felt physically exhausted. Researchers also assessed how much added weight or resistance they could handle on the bikes. Out of the 191 women, 40 women fell into the category of highly physically fit, 92 were at a medium level and 59 women were considered to have low fitness levels. Some of the women in the low category had to stop due to issues, including hypertension and chest pain, during their exercise tests. The women were examined for signs of dementia up to six times over the course of the 44 year follow-up (assessments were done in 1974, 1980, 1992, 2000, 2005 and 2009). “High fitness delayed age at dementia onset by 9.5 years and time to dementia onset by 5 years compared to medium fitness,” according to the study. The results demonstrated that the highly fit women showed a decreased risk of dementia by 88% compared to the moderately fit women. And we like the sound of that! So what does a high fitness level have to do with dementia? So think of it this way - exercise is not only good for physical health. It is also good for your brain health. So how can you improve your cardiovascular fitness level, a.k.a stamina? This all depends on your age, current fitness level and the status of your health. If you want to improve your fitness level, it is important to push yourself and test your limits. But, of course, you want to do this in a safe manner. If you have any health concerns or issues, speak with a competent healthcare professional. For how much exercise you should be doing according to your age, read here. And one report suggest that aerobic training just three to five days per week will help improve your cardiovascular fitness level. One of the best things about this type of exercise is that there are many options from which you can choose something you enjoy doing, like swimming, running or biking. My personal favorite is hiking. Nutrition is also key in improving your fitness level. If you do not fuel your body properly, you will not be able to workout at your fullest potential. The National Institutes of Health (NIH) suggests that whether you are a professional athlete or just casually going for a jog, nutrition can help enhance athletic performance. You are likely to get more tired quicker during a workout if you do not get enough calories, carbohydrates, fluids, protein, vitamins and minerals. To get the scoop on the importance of nutrition and exercise and how to eat like an Olympic athlete, read here. And ladies read here about specific nutrients that may specifically help women when it comes to exercise performance. Finally, It is also imperative to get a comprehensive nutrient test. If you have a deficiency in any nutrient, this could be detrimental to reaching your full athletic ability. And at the same time, having too much of any nutrient may also be detrimental and harmful.